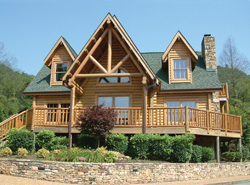 Log cabin home designs are made from logs that have not been milled into conventional lumber. These cabins are built by placing the logs horizontally and interlocked on the ends with notches. Typically Log Cabins are smaller than Log House Plans, since the term “cabin” indicates smaller, rustic homes such as a hunting cabin in the woods. Homes made of logs appeared in North America in the early 1700s and were quickly adopted by early colonists and Native Americans. In the 1920s, the first milled log houses appeared on the market, making these house designs extremely popular. 2903 Sq. Ft., Width 40'-8", Depth 40'-8"
The has 1 bedroom, 2 full baths and 1 half bath. 3315 Sq. Ft., Width 64'-0", Depth 58'-0"
The has 3 bedrooms and 3 full baths. 3167 Sq. Ft., Width 59'-0", Depth 37'-0"
The has 1 bedroom, 1 full bath and 1 half bath. 2587 Sq. Ft., Width 46'-0", Depth 36'-0"
4121 Sq. Ft., Width 125'-5", Depth 47'-0"
1939 Sq. Ft., Width 69'-0", Depth 76'-0"
The has 4 bedrooms, 4 full baths and 1 half bath. 7518 Sq. Ft., Width 104'-4", Depth 68'-0"
2696 Sq. Ft., Width 58'-4", Depth 56'-4"
The has 1 bedroom and 1 full bath. 1110 Sq. Ft., Width 27'-0", Depth 27'-0"
3644 Sq. Ft., Width 43'-6", Depth 27'-6"
Our beautiful Log Cabin house plans, with rustic, yet easy-to-read floor plans help you visualize your new home. With a wide selection, you will find a plan to fit your lifestyle. Find a dream log cabin home and build it just for you. Check out House Plans and More for our selection of rustic floor plans that you are sure to love.